The Roland JUNO-DS76 is the portable modern synth that can keep up with your busy band life. Lightweight, compact, and powerful, this 76-note instrument is always ready to go, with easy operation and instant access to pro onboard sounds that let you create or perform music anywhere, from studio to stage. And at a weight of just 15.25 lb./6.9 kg, its portability is second to none. The JUNO-DS76 is equipped with a huge variety of ready-to-play pro sounds for any genre, and features an expressive 76-note keyboard for maximizing your performance style. The wider keyboard range make it more comfortable to use split setups, such as playing organ or synth sounds with the right hand and a bass sound with the left. The keys are also a little longer than a standard synth keyboard, providing a playing feel that's smooth and consistent no matter where you press a key. The JUNO-DS76 has the pro onboard sounds to keep you covered, whatever genre comes up next. Instantly choose your favourites from nine categories, and with over 1,000 sounds that include acoustic and electric pianos, organs, and synth, there's enough choice to cover any musical genre or performance style. What's more, the patches from the previous-generation JUNO-Di synth are fully compatible too. Just think of a sound and it's right there at your fingertips with the JUNO-DS76. Just because your bandmates aren't available to rehearse, that doesn't stop you from honing your skills with a jam session. 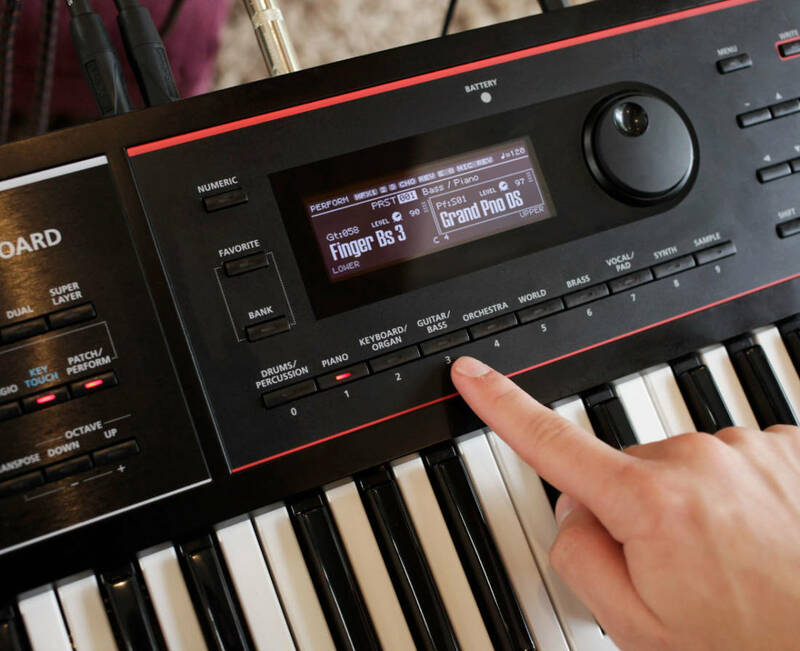 Using the JUNO-DS76's eight Phrase Pads, you can add instant beats under your keyboard parts or copy MP3/WAV audio data to USB memory and play along with full-band backing. When your shows need more dynamics, the Phrase Pads also function as a live sampler. Just load them up with anything from sound effects to loops, and then trigger them with a quick touch during the gig. If you're a solo performer or singer/songwriter, you'll love the JUNO-DS76's mic input, which lets you get great vocal sounds without having to carry around extra gear. There's a dedicated vocal reverb, plus Auto Pitch for singing with the "stepped" electronic vocal effect popular in today's music. The built-in vocoder is inspirational too, allowing you to sing into a mic and control the tone and pitch via sounds played on the keyboard.